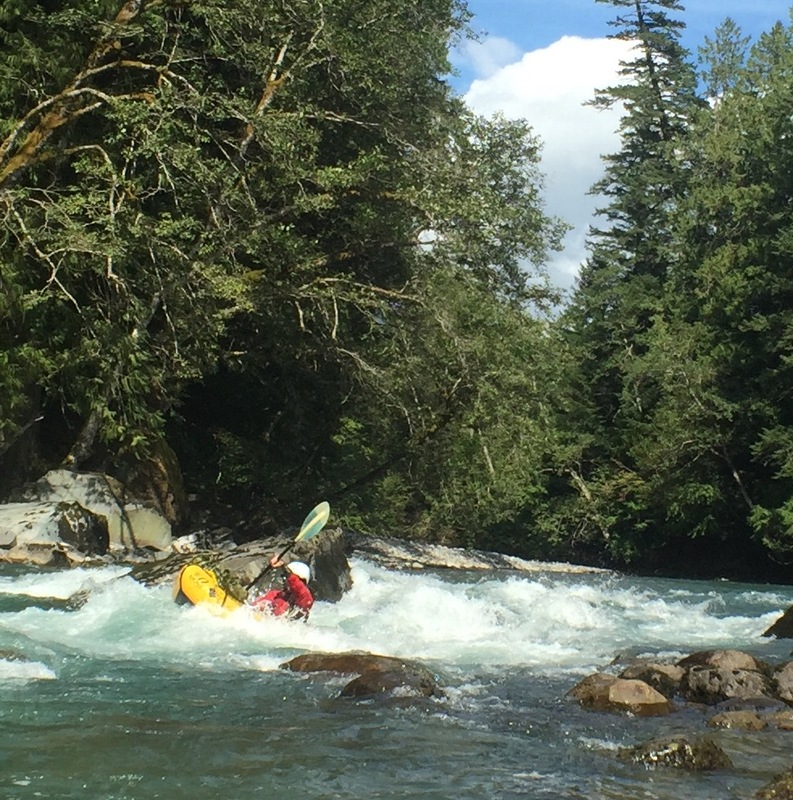 After having hopes for an epic bike-rafting weekend trip dashed by the flu, I set out on Sunday to hit up the Paradise Valley run of the Cheakamus River, a section of moderate whitewater popular with Squamish kayakers. There are a number of options for accessing the river with a packraft, but the easiest is to park near Fergie's Cafe and (similar to the start of the Squamish Coffee-Pizza Traverse) walk or bike up the Paradise Valley road to where it ends at the trailhead for the Cheakamus Canyon section of the Sea to Sky Trail. With two cars, you can also run a shuttle on this section for an even quicker float. The Paradise Valley run is one of the best sections of river in the Sea to Sky for novice paddlers to build their skills and technique. There are great opportunities for river-reading, some hazards to avoid, and plenty of places to practice ferrying and catching eddies, with a few rapids to keep it interesting. One of the flat sections. After coffee and breakfast at Fergie's, we rode our bikes for a little less than an hour, inflated and got on the river by just after 11:00. We left our bikes at the put-in to pick up later, but you could also bike-raft this run. The first kilometer or so was fast moving, great for practicing ferrying and catching eddies. At the first major rapid, a high sweeper made things a little challenging, and if the water level rises, it may become more of an issue. Below this, we navigated a few wave trains and small rapids, nothing that required scouting. About an hour into the run, we lined up above Culliton Creek Rapid, a Class III drop just above where the creek enters the Cheakamus River. It's a straightforward rapid with a large, flat section of river below in case of a swim, just be on the look-out for wood. We ran it river-left of the big rock. Below this, the river mostly flattens out with a few small wave trains and Class II rapids. When we paddled it there as a river-wide strainer a little more than 3/4's of the way down. We pulled out right beside Fergie's, on the left bank just below the last major rapid on the run and before the Squamish Valley Road bridge, but you could also make this a longer run by continuing down the Cheakamus to where it joins the Squamish and on from there.